Import Scanned Document for Excel (PDF to Excel OCR Converter) imports scanned and normal PDF document files to editable Excel documents. Import Scanned Document for Excel can batch convert all types of PDF files to import data for use in Microsoft Excel, OpenOffice, Google Docs, and WordPerfect Office. Import Scanned Document for Excel uses optical character recognition (OCR) and maintains the styles an structure of the original scanned documents as best as possible. The solution is comaptible with all versions of Windows 2000/XP/2003/Vista/7 and Excel 97/2000/2002/2003/2007/2010. Standalone application - Adobe Acrobat not required. Supports import from encrypted PDF files and password protected PDF documents. Converts scanned PDF files into Microsoft Excel 97-2003 XLS and MS Excel 2007 XLSX formats. Create an Excel worksheet for each PDF page in the document or import all into a single worksheet. 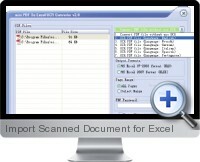 Fast and accurate data importing to Excel. Retain original page layout and styles. Batch conversion of multiple documents to Excel files. Detect all tables and discard non-tabular content for clean data files. Reuse data in a variety of applications include Excel, OpenOffice, and Google Docs. Use OCR to unlock text frozen in scanned and image PDFs. Use OCR to convert PDF text to formatted editable Excel documents. Use OCR to take tables from scanned documents and convert them to formatted Excel spreadsheets.